Sleeping with someone is one of the most intimate things you can do in life, except for sucking on a really long piece of spaghetti until you make out with a dog. 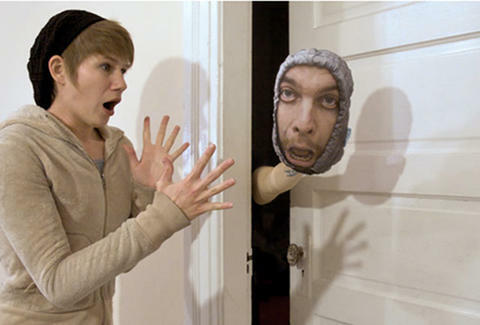 Now letting you avoid the awkwardness and just sleep with their face, the guys behind PillowMob. Launched by an SD native and his Seattle-based partner who probably knows how to use computers and stuff, Mob was born from the ridiculousness of the latter's bro-in-law ingeniously giving plush dolls of himself to his wedding guests, and is exactly what you think it is: a strong-arming organization that has its eye on controlling all bed-related industries pillows that look like freakin' people's faces. To spread your mug shame, simply upload a choice shot, pick from circular or oval, crop for a satisfying fit, and, finally, decide on "hair color" for the back, with choices ranging from large textured nubbins in a slew of colors, to animal prints, to a fuzzy "Fake Cheese", and just by looking at it, it's Easy to see what they mean. The turnaround on custom jobs is about three weeks, so wait-haters can choose from the ever-growing library of pre-mades including beauties like OHH with a blonde/ blue-haired chick showing off her "O" face; and a blank-faced, scruffy dude in a hood called Creeper, so it may be better if you keep that purchase on the down low...said nobody is suppppposed to know! They're currently working on a mobile app so you can pillow-immortalize stupid fun on the go, and because people come in all shapes and sizes, they'll soon expand beyond the roundish offerings, potentially to full-body pillows, which're perfect to hold on to at night, when you realize your Lady is a Tramp.